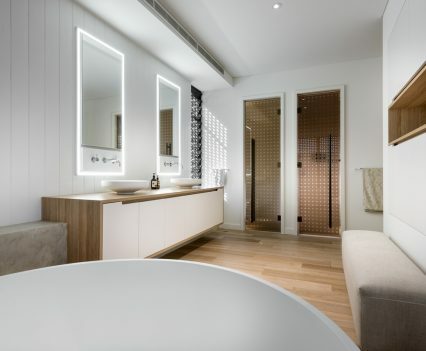 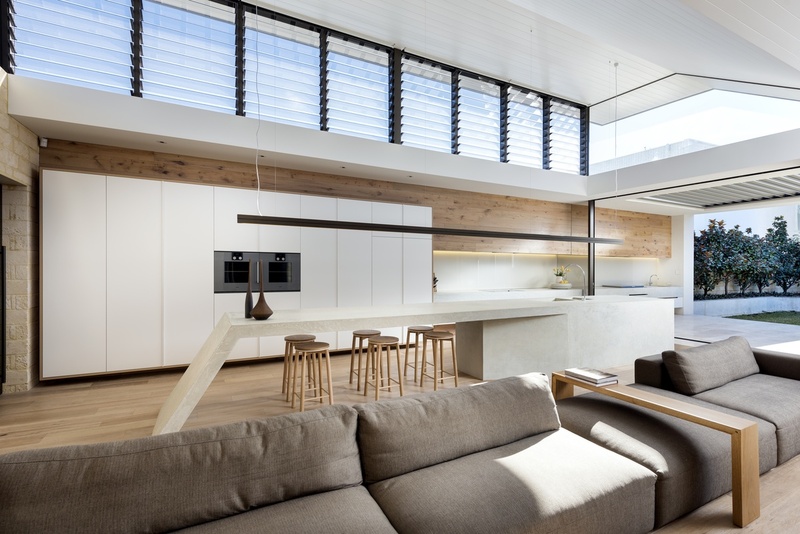 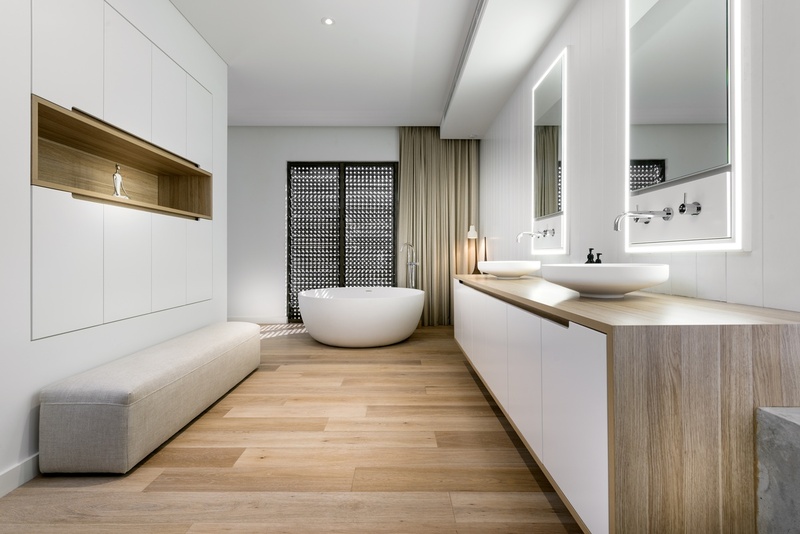 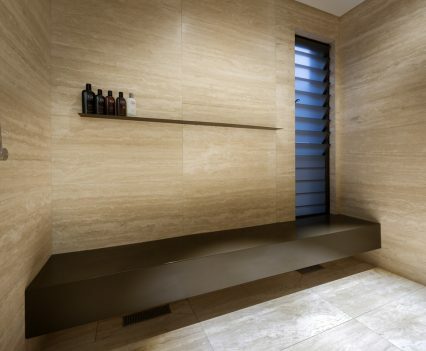 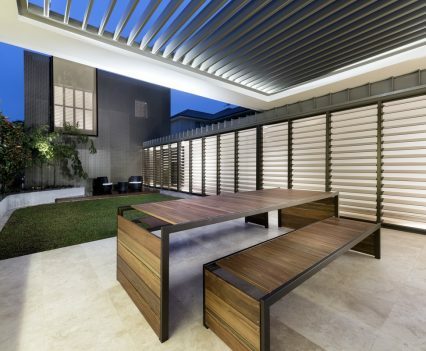 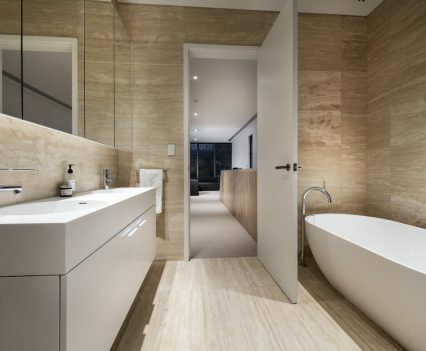 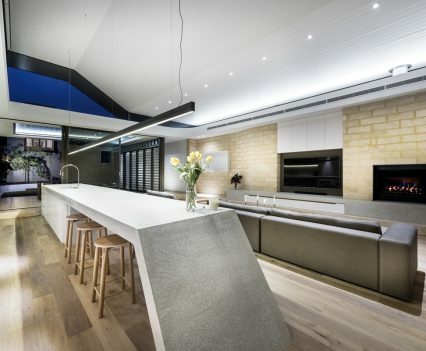 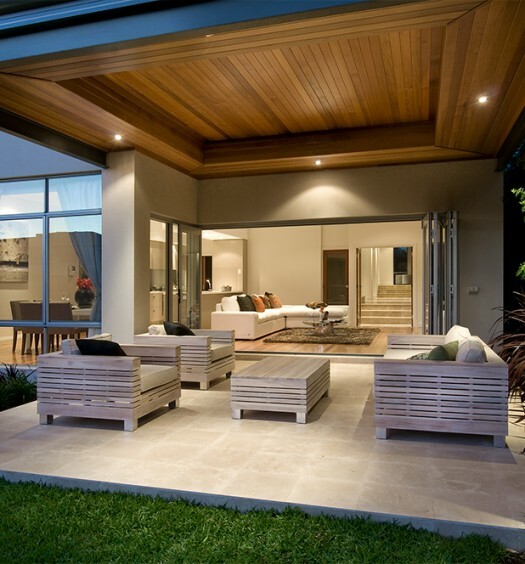 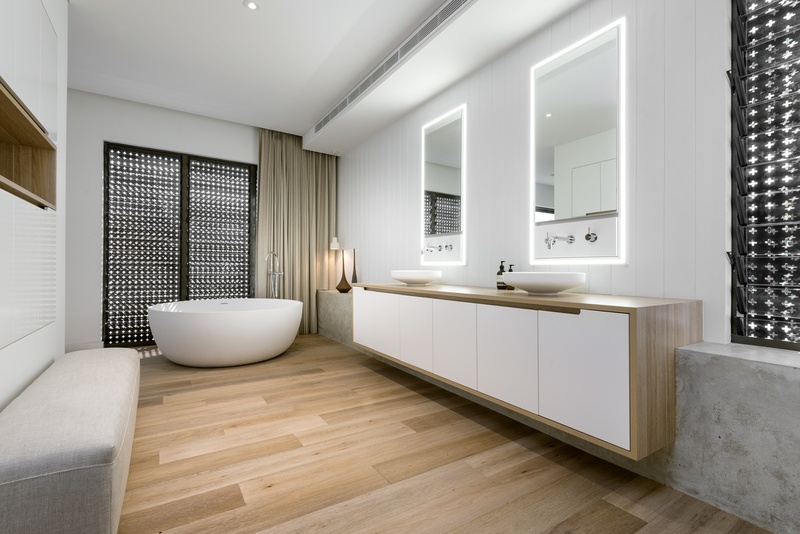 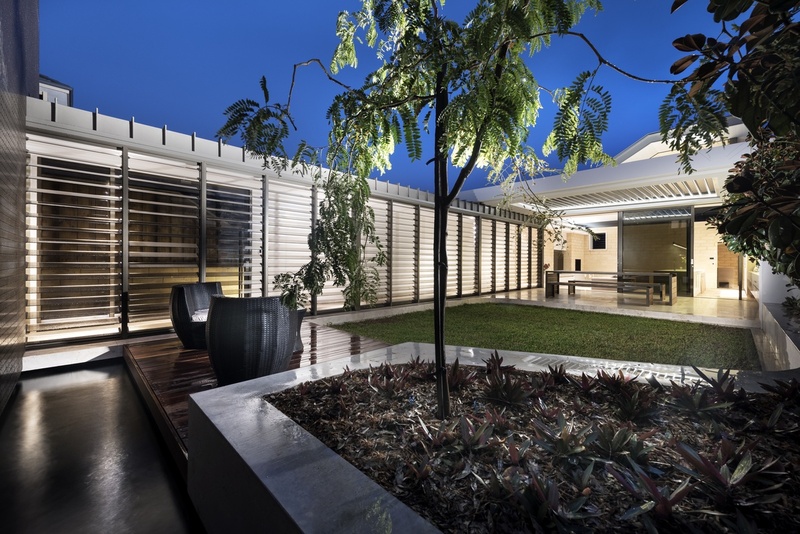 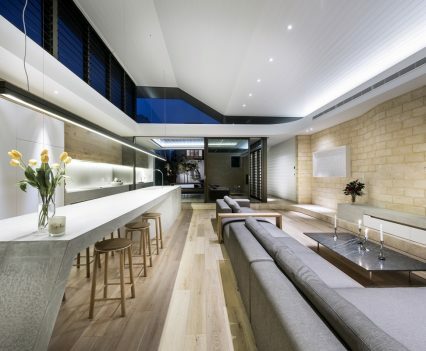 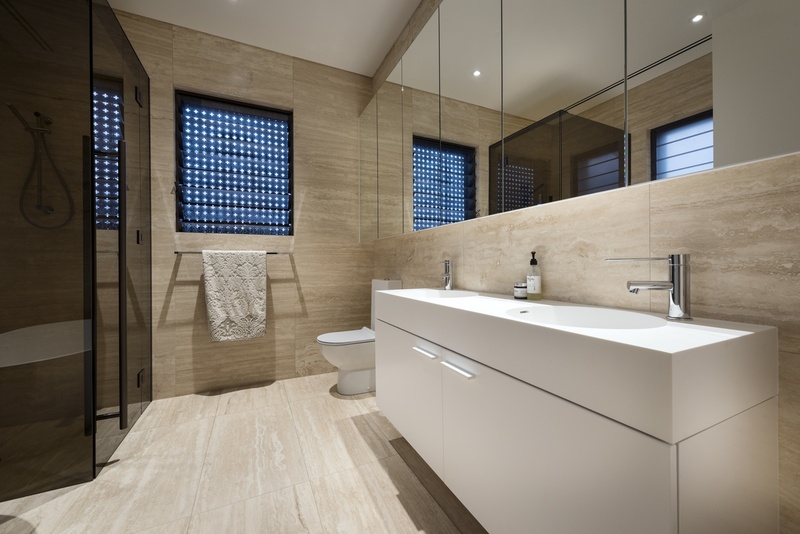 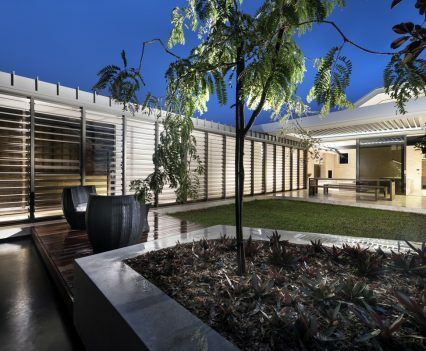 Winner of the 2015 Home of the Year, luxury custom home builder Weststyle Design & Development have received accolades again this year for this contemporary new home, picking up the prestigious Peter Overman Award for Perth Innovation in Housing as well as Bathroom Design of the Year at the recent HIA awards. 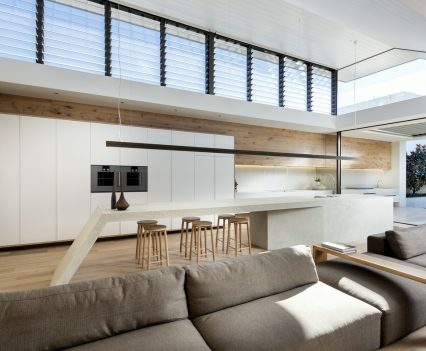 Positioned in Cottesloe, the vision for the home was to create a modern interpretation of the beach shack, utilising a neutral palette of natural materials that would enhance the beauty of its ocean-side location. 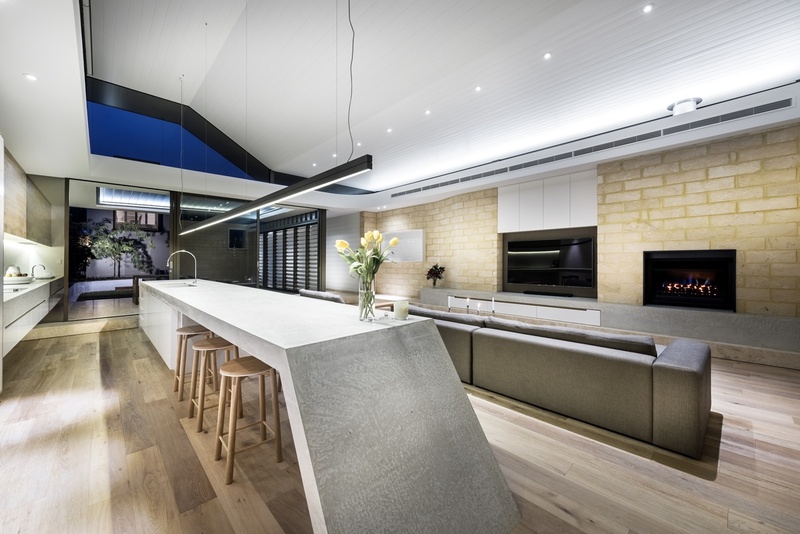 Working with a narrow block of only 10m and a site with a four meter drop from front to back, exceptional design initiatives have delivered a home that despite the limitations of the site is not only functional but architecturally stunning. 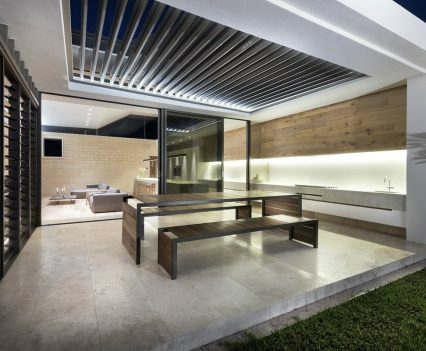 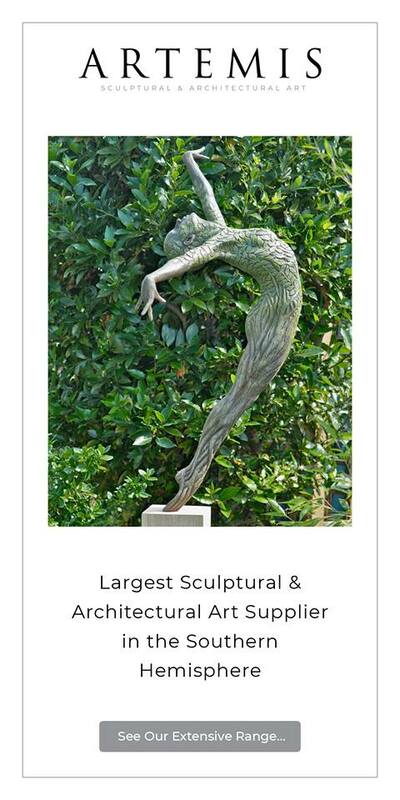 Two buildings separate the sleeping and living zones and are connected by a gallery walkway and central courtyard that allow the home to take in an abundance of natural light and views of the surrounding pine trees. 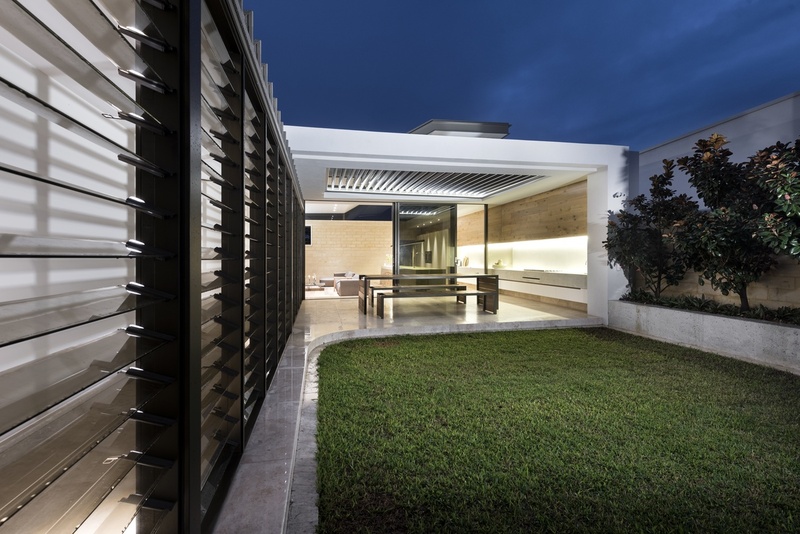 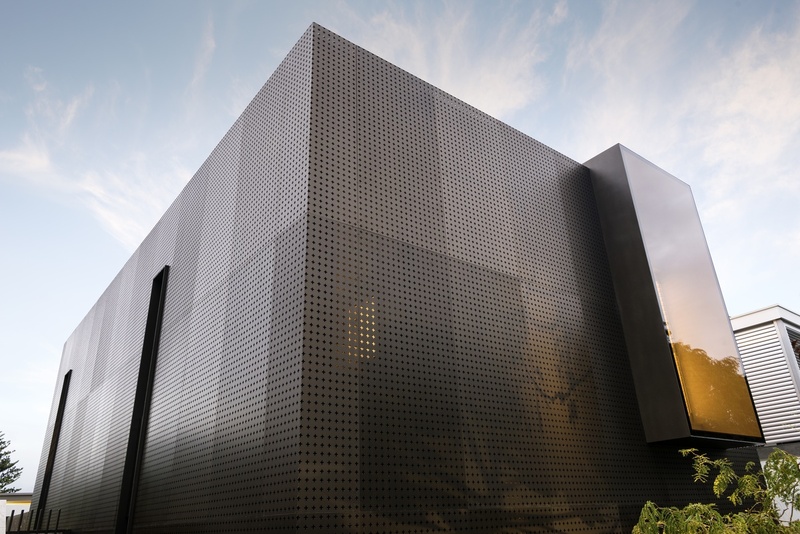 The front of the home houses the bedrooms, and privacy and energy efficiency has been added via 140 custom made metal screens that wrap the building, skilfully joined so that each panel blends seamlessly with the next giving it a striking sculptural appearance. 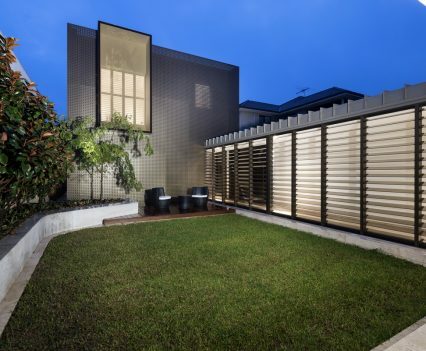 Naturally the screens shade the windows, and framed off the double brick walls by100mm, heat absorbed ty the screens is deflected rather than transferring to the building, rising between the screen and the wall like a solar chimney. 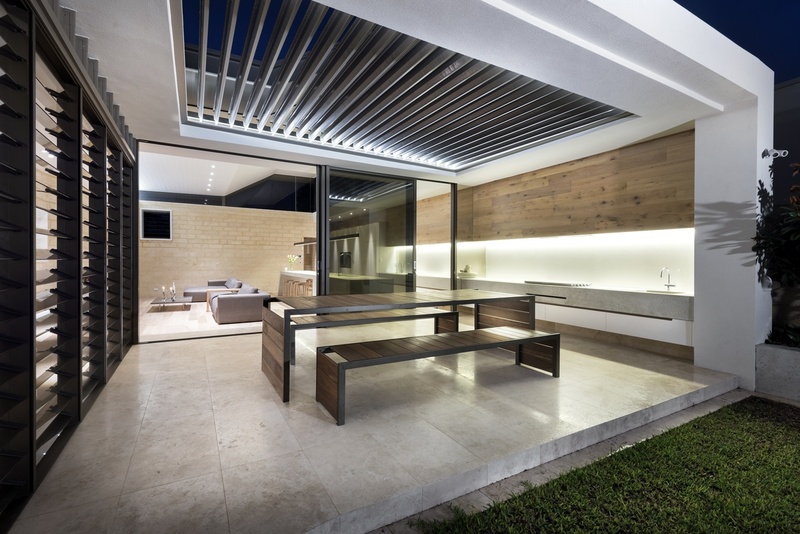 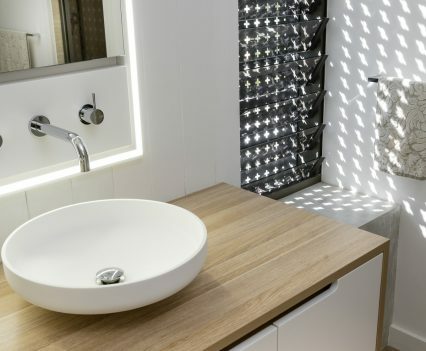 Aesthetically the screens conceal practical elements such as downpipes, wall vents, hot water units and windows positioned for practicality rather than appearance. 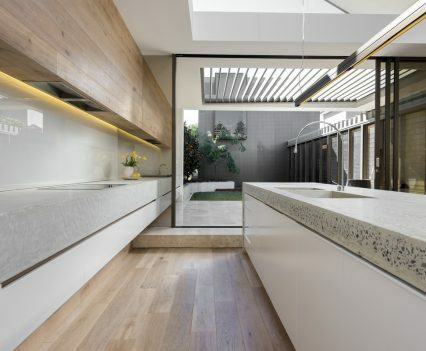 The pattern itself was designed as a symbolic reference to the aerial view of the Norfolk Pines as they align down the avenues of Cottesloe, and internally the pattern adds a beautiful filtered light into the home that dances off the internal walls and surfaces. 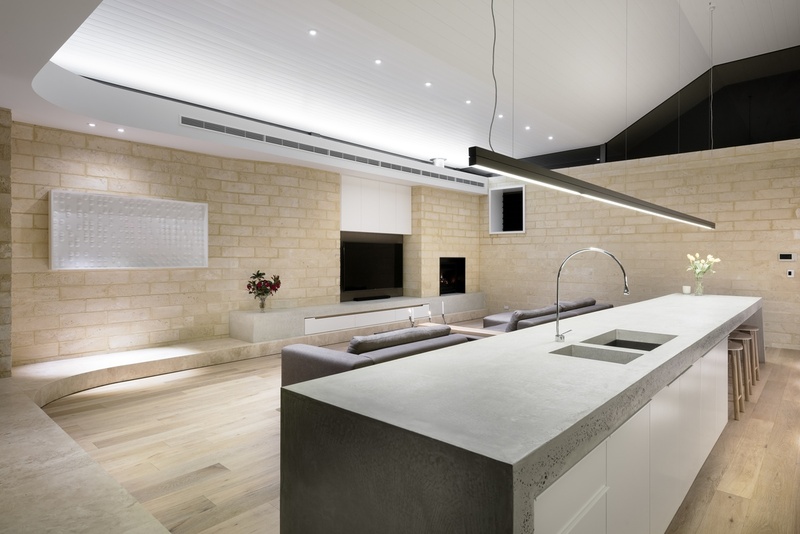 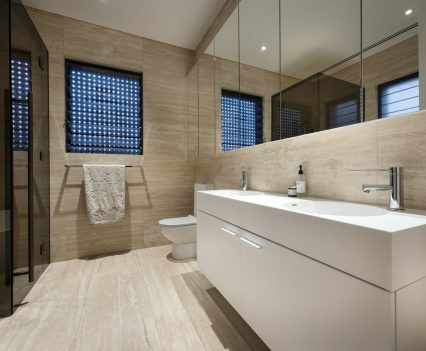 Throughout the home use of raw materials including, limestone, travertine, oak timber floors and white timber lining combine in a soft neutral palette that adds to the coastal ambience. 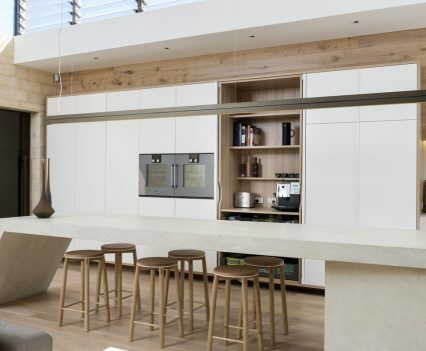 The open plan kitchen and living areas are expansive and filled with an abundance of light and sleek cabinetry conceals many functional elements for a clean minimalist appearance. 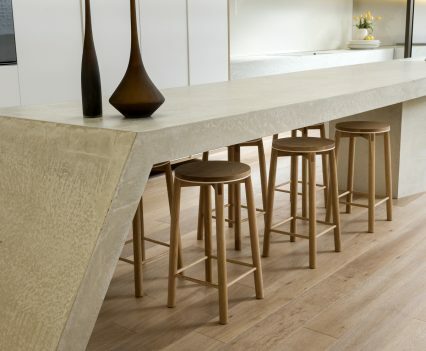 At the center, an impressive eight meter long, hand crafted off white concrete island bench built on site, adds a sculptural element to the room as well as function. 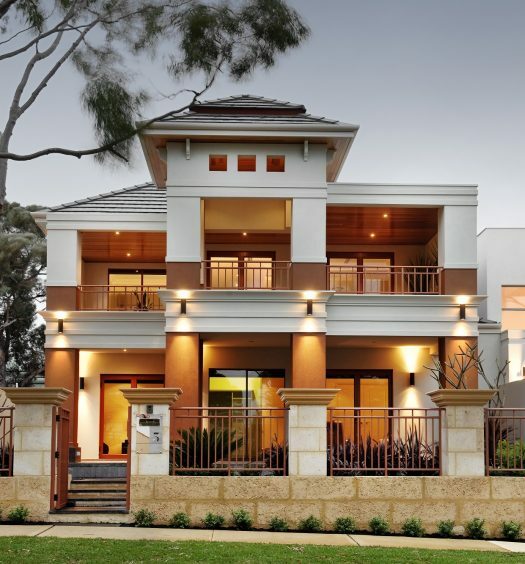 This outstanding project by multi-award winning Perth custom home builder, Weststyle Design & Development was featured in our 2017 luxury homes annual, WA Custom Homes.